press release found here. The top three are definitely Season 2, while the other three are kind of vague, and could be season 1. (Update - Gasping picture below in HD). Also randomly found in the press release, general character bios. See after the pictures after the page break for a copy. The above picture is something you really want to look at. The other pictures (for the moment) are LD, where as someone found an HD version of the above. 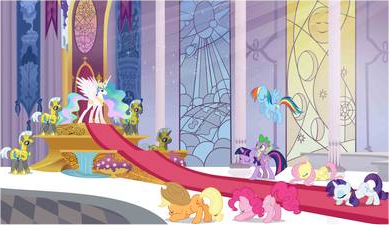 Someone was pointing this out on /co/, but take a look at the stain glass windows. Now maybe I'm crazy, but this is probably a very good insight on the first episodes. The first thing you're going to see are dragons. One brown one (on either side). The next window is the same design of the brown one, except white, with what can only be assumed as Celestia and Luna circling. 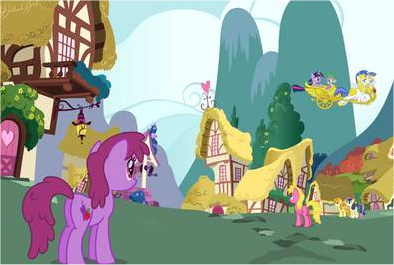 Go further, the window on the right side, extreme front, shows the mane 6 below some sort of symbol. On the left side, three windows back, you see something that very much resembles puppet ponies, three of them. 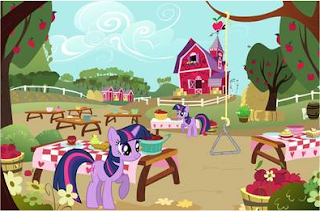 Now this might be stretching it, but isn't the colors very close to Cutie Mark Crusaders? You be the judge. Dutiful and intelligent, TWILIGHT SPARKLE is obsessed with one thing: studying magic! 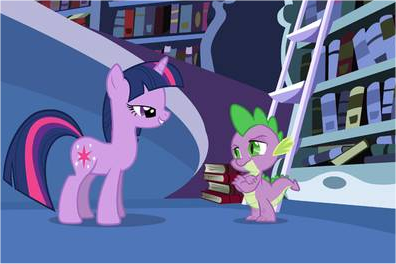 She once studied so much, she made no time for anypony else. That is until her mentor, PRINCESS CELESTIA, charged her with the study of a special kind of magic--- friendship! Newly converted to the joys of having friends, she uses her knowledge and unusually powerful gift for magical spells to help her new companions in PONYVILLE. 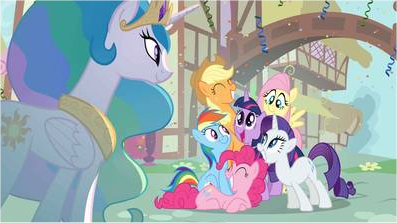 Though sometimes she gets on her “high horse” about what’s right or wrong, her eagerness to learn and lend a helping hoof endear her to her new friends in PONYVILLE, and when the going gets tough, her love for her friends transform her into a natural born leader! Capable and athletic, RAINBOW DASH lives for adventure! When any problem should arise that involves traveling to distant lands or dealing with a magical, mysterious beast, RAINBOW DASH is the first to volunteer! Brave and bold, anypony who has ever seen this rainbow-haired Pegasus in the air has been left in jaw-dropped awe of her speed, agility, and, well, her confidence. She’s quite positive she’s the fastest pegasus pony alive, and truth be told, she probably is. Yes, she’s a bit proud, and a bit mischievous, and when the chips are down, and danger is a-brewing, RAINBOW DASH always, always comes through, proving time and time again that she is a true hero!